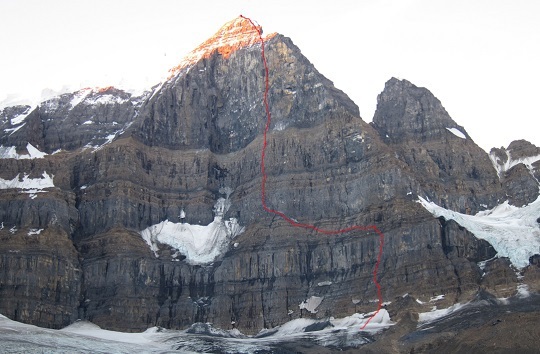 With only three ascents in 29 years, by the likes of George Lowe, Barry Blanchard and Steve House, the North Face of Twins Tower is one of the most storied walls in the Canadian Rockies. On September 15, Canadian Jon Walsh and American Josh Wharton completed the second ascent of the North Pillar (5.10 A2, 1500m) of Twins Tower, a sub-peak of North Twin (12,200'), "A mountain archetype," as Steve House describes in Alpinist 8. "[I]t bursts skyward from the very belly of the earth, gaining breadth with height and then like a stone wave turning concave and slim and sharpening to its bifurcated crest." The route, considered to be the most technical and sustained line up the North Face, was pioneered by Barry Blanchard and David Cheesmond in 1985. "It seemed like we were right on the edge of our risk tolerance levels the entire time, and perhaps even crossed the line," Walsh wrote on his blog, "Staying on that edge for such an extended time was exhausting!" At 4,500 feet, the North Face is the biggest face in the Canadian Rockies. "That's definitely part of the appeal to it," Walsh said recently regarding his motivation to climb the North Pillar with Wharton. The duo climbed the route in well over 30 pitches.